There was a bear who hibernated in a cold dark cave all through winter, sleeping soundly and soundlessly, all the while dreaming of sunshine and delicious things. Deep in her slumber in the belly of the cave, she once dreamed of basking in the golden rays of summer light with wildflowers in her hair sipping delicious crimson-colored sour cherry sharbat. The dream felt so real and so deep was the desire that the bear woke with a start only to find her contemplation of the bold bright red color of sour cherries was merely a haunting chimera in the empty pitch black darkness of the cave that was her crib nestled in the stark white and gray palette of the winter howling outside. With a sigh she fell back to sleep — waiting and wishing for summer and spring. It was spring when she stirred awake again. The bear stretched her limbs, left the cave, and twirled in the daylight — dazzled with life and light. The very hungry bear craved many things and so the bear ate and ate and ate. 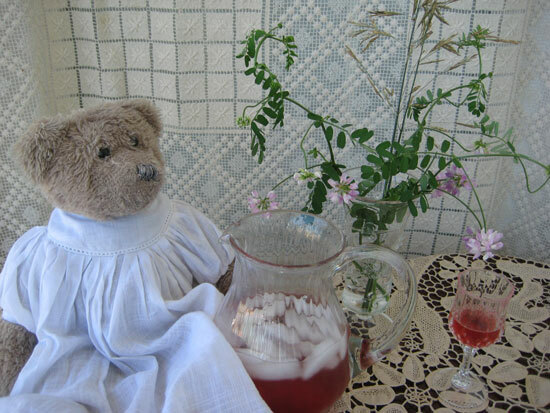 Oh, this bear meant to make up for the winter-past and the winter that was to come — not losing sight of the deprived pang of her frosty midnight yearning for the luscious tart redness of sour cherries and the sweet elixir of sour cherry sharbat. Come early summer time, sour cherry trees in the orchards proudly bore their pretty fruit. The bear ate her fill! Munching fistfuls and spitting the stony pits with glee. 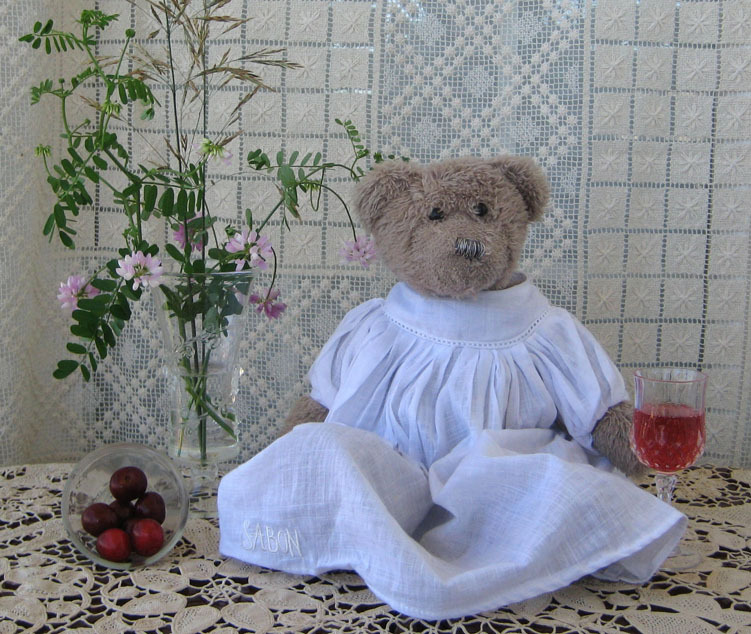 And she made sour cherry syrup (as was her wont and custom as a Persian bear) so that all summer long, she could make ruby-hued sharbet ‘eh albaloo sour cherry drinks and spritzers to sip and sip. For herself. For her friends. To murmur with pleasure. To keep all thoughts of winter at bay. Wash the cherries and remove the stems. Mix sugar and water in a big pot and boil for 5 minutes. Remove pot from heat and allow to cool. Pour syrup into a sterilized, dry, airtight bottle. 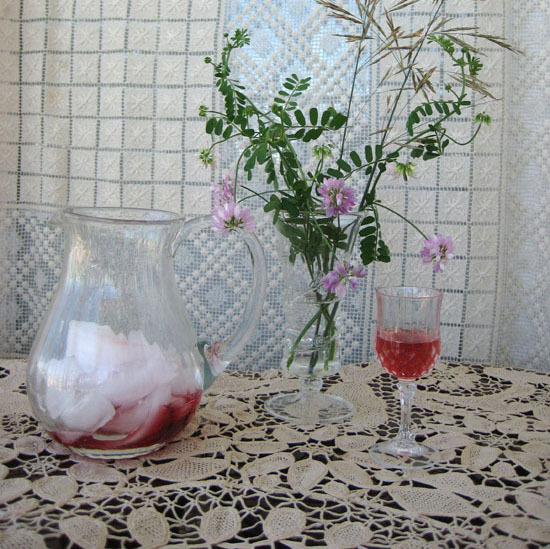 In a glass (for individual serving) or in a pitcher (for a group) mix syrup, water (flat or sparkling) and ice cubes. Stir and serve well chilled. How much syrup and how much water? The general consensus is 1 part syrup for 3 parts water, but in my opinion, play with the proportions to find what flavor and color suits your tastes the best. Personally, I like my sharbat on the more diluted side with just a hint of color. The bear likes hers with a deep robust color and on the sweet side. Eat it. Enjoy it. And as they say in Farsi: Noosheh Jaan! It really is the quintessential Persian summer drink, isn’t it? You should try it as a spritzer (with sparkling water) too if you haven’t. I think it’s really good that way as well. I love Sharbat and now to find some sour cherries. I just bought some Rainier cherries but think they are too sweet to use in this. Delicious and a very talented bear it is! Suzanne, sharbats are the best. 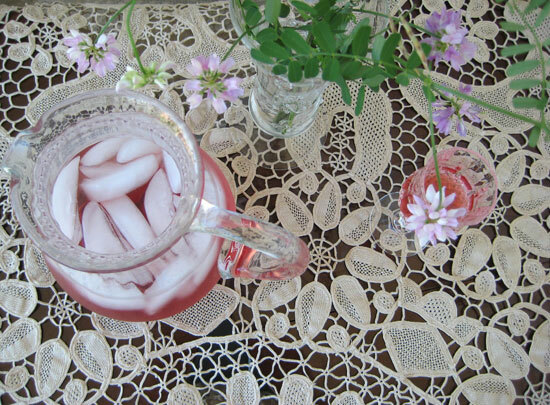 You know, you could use the same recipe and make a cherry sharbat instead. I would recommend adding 2 tablespoons of freshly squeezed lemon juice once the syrup is cooling to just balance out the sweetness a bit. 1st of all may I say how much I like your blog & navigating through it? It is like a treasure box that every time you open it a new thing pops up & draws your attention. And about today’s. YES. Mouth watering & nostalgique. Me 2 theunmanlychef. ALWAYS. Albaloo is one of my favorites in ALL things, best of all البالو خوشگه (Dried ones). Too bad what we are able to find here NEVER tastes the same in my opinion. Azita joon while in Iran did you try some? Were they even in season? How about the dried ones? Well, you are then reciprocating fully because your comment is equally a treasure box that is just making me smile and smile. Thank you! I DID try both lavashak ‘eh albaloo and dried albaloo when in Iran. Nemikham dahanet ro ab bendazam but I must say: both were amazingly delicious. Jat khalli! LMAO I love this post. So so cute. So real. That cherry drink seriously looks amazing. I would love some. I’ll have to make this. Hee, hee, thrilled to hear it. Do hope you make it Amanda joon and let me know if you do, OK? Did someone spike that dear bear’s Sharbat? Lovely post Azita and so true that you need to enjoy every moment of the delights that summer brings you! Cherries are such a treat… though unfortunately I’ve never seen Sour Cherries for sale here before. yeah, the bear spiked her own drink, ha ha. Interesting to see the origin of “sherbert”! I’ve been hearing a lot about sour cherries lately. Apparently they are very good for gout from which I suffer. I think sour cherries have many virtues and I wouldn’t be surprised if they are good for gout and speaking of: sorry to hear you have to deal with that and best wishes in your treatment. Ideally, sour cherry sharbat could be a delicious part of the cure! Haha the last picture is so funny! I love the color of the syrup. Thank you for visiting & commenting Mary Frances! Azita jaan, Sharbate Albalooooo! Lots of memories of ‘summers of Iran’. Hi dear Fae! My folks get fresh ones from an orchard in the DC area and then my mom freezes a few batches. So I’m not sure actually if frozen ones are widely available. Ooooh this reminds me of my childhood visits in Iran where my family would serve me this made of cherries from their own trees. Akh, akh … cherries from one’s own tress in Iran … what a lovely memory. It makes me wistful just reading it. Thank you so much for visiting and commenting Sharareh jon! Amazing post Azita! The story…love it! Ha ha a Persian bear. Love your intro. I’m not a bear (except sometimes) but I would love to try this out. hahahahahha! 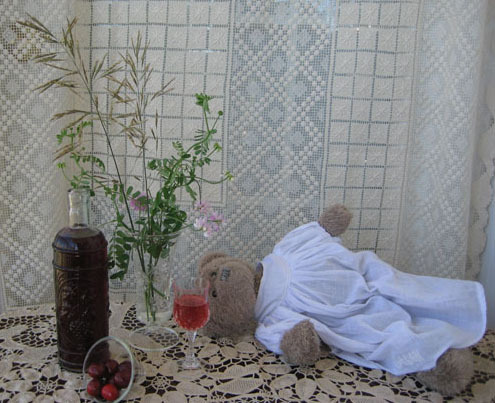 The bear is drunk! 🙂 What a refreshing sour cherry drink! Yumm!